We all know Australia Post is in peril, as the preferred method of communication has shifted in the last 15 years from snail to email, but this is ridiculous. Do you "rent" a post office box from Australia Post? If you do, then you will have noticed this year's bill, which has just arrived go up around 22%. The increase has occurred every year for at least the last four. This year, the annual rental for a small box sits at at whopping $91, with a generous $5 discount if you cough up before the end of the month. It seems renting out a hole in the wall, is rather lucrative in these heady days of economic uncertainty. 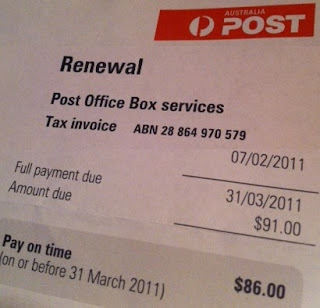 What have AusPost done to earn the extra dosh they're charging each and every year? A silver lining inside your box? A soy latte awaiting for you when you retrieve your mail? Sexier, hotter staff? Home delivery? Oh, didn't we used to get a delivery as part of the stamp that the sender paid? What a scheme. And we thought used car dealers and real estate brokers were the dodgy ones. Holes in walls aren't cheap mate, we just paid a motza for a hole in the wall for dear old Mum's ashes. My PLB account has actually gone up 9.76%. Not sure why the one you quote is such a difference. If I go back to March 2008 - 3 years ago - yes it has gone up 22% since then.